Like applying for a mortgage, or buying your first pair of reading glasses, grey hair is part and parcel of getting older. While old wives’ tales would have you think it’s your demanding boss, sizeable debt or Machiavellian mother-in-law that results in silver locks, it’s not stress- or lifestyle-related but simply a matter of genetics. And while some of us – understandably, given how much rides on your looks both personally and professionally nowadays – would sooner give up the ghost than be seen grey-haired in public, there’s really no reason you can’t work greying to your advantage. After all, it certainly hasn’t done George Clooney any harm. In celebration of silver hair, we caught up some of the UK’s top barbers and hairstylists for top tips on upping your grey game. There’s little sense in arguing with that; although finding your first few greys might not be something you’d celebrate with a round of drinks, you’ve still got plenty more to work with than your bare-headed peers. 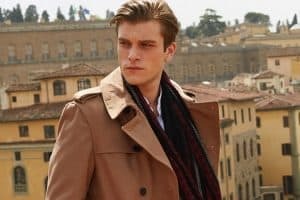 In fact, so cool is silver hair currently that twenty-somethings are even dying theirs to get the look: “We’ve seen a massive increase in young men wanting to actually dye their hair silver grey or even white,” says celebrity hairstylist Jamie Stevens – so grey’s no longer timelessly stylish, it’s fashionable too. 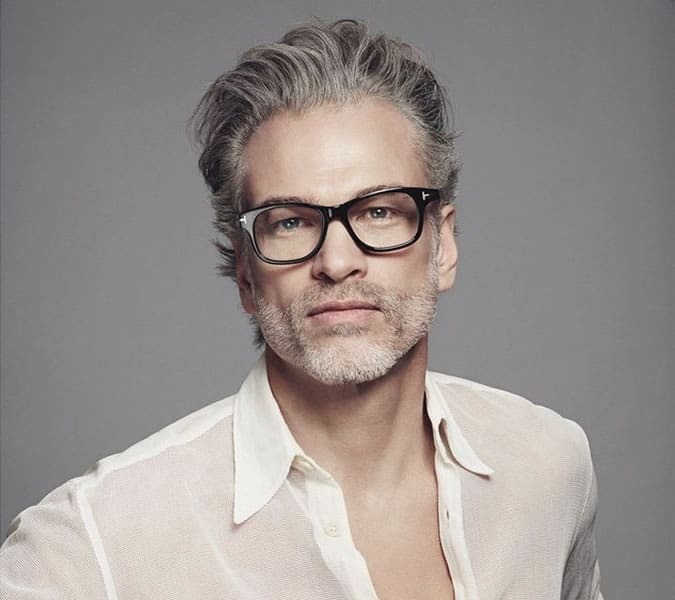 While the overriding opinion from the hair experts we quizzed was that men, regardless of their age, should embrace their greys, we understand that there are situations when silver isn’t ideal: when you’ve just turned seventeen for example, or if a head of grey hair just isn’t going to complement the hues of your wardrobe’s carefully curated colour palette. So, if you’d rather keep the colour, be sure to choose a tone that’s as close to your natural hair colour as possible, without going too dark or light, and always opting for a matte, rather than high gloss, finish. It’s also worth bearing in mind that if you keep your hair short, it’ll need regular re-colouring. “You need to colour short hair every three weeks because regrowth shows through much quicker,” says Daniel Davies, general manager of Pall Mall Barbers. So, if you decide to disguise your greys, be prepared for some legwork. If you’d rather keep things as nature intended, you’ll still need to give your locks (no matter how short) some tender loving care. “Silver shampoo is a really great way to keep grey hair looking cool as ice, as it works to remove brassy tones from the hair,” says Jamie Stevens. By removing any yellowy tones to the hair, silver (or silvering) shampoo gives grey hair a vibrancy and healthy shine that it can often otherwise lack. Picking up an argan oil-enriched conditioner could also prove beneficial, according to Daniel Davies. Grey hair has little to no pigment, and lacks the proteins that not only give hair colour, but lend it a healthier, softer texture too. Argan oil – being rich in Vitamin E and omega-6 fatty acid linoleic acid – restores moisture to hair. Useful if your barnet’s prone to frizz. Although TV and radio presenter George Lamb’s expertly kempt salt and pepper ‘do looks good lengthy, grow yours any longer and you’re veering dangerously close to Gandalf territory. In truth, grey hair tends to look better – and less ageing – when kept short and tidy. And if you’re lucky enough to go grey without beginning to recede at the same time, you’ll find your pool of potential styles is considerably wider. A buzz cut, French crop or tidily finished quiff are all styles that look great with silver, white or salt and pepper hair. “A 1950s-inspired, Cary Grant-esque side parting also works well,” says Brent Pankhurst. That said, if you’re lucky enough to have kept most of your hair, there’s no need to limit yourself to a safe short back and sides – undercuts and pompadours are all fair game if you have the confidence to pull them off. Just make sure the cut you choose suits your personality, lifestyle, job and face shape before taking the plunge. If, however, it’s not just the colour of your hair you’re losing, then you’ll need to make the most of what you’re left with. It’s also worthwhile requesting texturising scissors be used for hair on the top, as it creates the illusion of length and volume. If you’re smart enough to take our experts’ advice, then you probably won’t have much need for an arsenal of styling products. But for styles that require product for structure or texture (a quiff, for example), Davies suggests styling hair once it’s been blow-dried and using a clay-based product to achieve a matte finish. Wet look gels, glossy sprays and hair oils, on the other hand, can ‘dull’ grey hair and leave you looking a little too Corleone. “If you’re capable of growing a short beard, you should definitely pair your hair with some salt and pepper stubble,” says Ted’s Master Barber. From José Mourinho to John Slatterly, George Clooney to Anderson Cooper, there are plenty of men of note not letting a lack of melanin cramp their style. Look to these silver-haired dons for inspiration. Going grey isn’t a sign of dwindling masculinity, but an all-new stage of your personal style instead. Treat your greys right, get a tidy cut and start reaping the benefits of being considered a more mature man – whether or not you act your age.